A lot of artists find the idea of building a musician’s website daunting. It’s difficult, it can be expensive, and is it really necessary with Facebook, Instagram, Twitter, Snapchat, Spotify, Bandsintown, and all the other profiles you need to manage? While a huge amount of business and fan growth takes place on social media, if you don’t have an effective musician’s website, you’re going to have a hard time being found and noticed by fans and industry (bloggers, managers, A&R reps, etc.) alike. You absolutely need to have your own domain as it represents your shingle on the web that is fully in your control. Effective social media trends come and go, (hello Facebook!) but your domain is yours forever. It is perfectly possible to create an effective musician’s website at an affordable price. There is a global marketplace of fabulous platforms and talented designers (like ours) who can help you build a beautiful site for a few hundred dollars. Or, if you are willing to do some of the work using a templated design, an effective musician’s website can be created for less than $20/month with no upfront costs! A lot of artists drive themselves crazy building their musician’s websites because they forget that simplicity is key. Number one: Help you engage with current fans and make new ones. The easiest way to register a domain name is to use GoDaddy. You can register a domain in almost any country through GoDaddy, or you can use other country-specific sites like Crazy Domains (AUS). Register the domain that you would like to use. I highly suggest a dot com (.com) with no slashes and underscores if possible. GoDaddy will guide you through this process, and if you have any questions, their customer service is great. TIP: Try to purchase a domain name that matches the URLs on your Facebook Page, Twitter, Instagram, YouTube, etc. This way, if someone Googles you, they’ll easily find your musician website and all your social media channels. Working with a website builder can get you up and running quickly and if you are computer savvy, you won’t need a designer to build the site for you. Here are my favorites in alphabetical order. All have excellent call-in customer service to help ease the confusion. Their lite version starts at $8.29 per month (if you purchase a full year). It’s easy to use, there are many great templates to choose from and the first month is free! Use this link for a discount! Squarespace is wonderful and highly flexible. Sites come with a free custom domain, and they make it easy for you to create a beautiful, professional website. You can choose from a vast array of templates (some designed specifically for musicians), and you can switch between them at any point. If you are challenged by the builders (they are navigable but not that easy!) then you might think about hiring a designer to help you initially. Might I be so bold as to suggest hiring us? and if you do hire a designer to help you, don’t go crazy with elaborate films and Flash intros. If people get confused by your musician website, they’ll leave fast so, keep it simple! Step 3: Make Your Homepage POP! Your entire website should be easy to navigate with a navbar across the very top of each page so visitors can see it (not buried where they have to scroll down). Your homepage should feature your name and your pitch, or a captivating image that makes people understand who you are and what you sound like. Remember – your site needs to support your brand! The colors you choose, your logo, the pictures you use… these things are all incredibly important, and help tell your story. Figure out what story you want to tell, and then keep your brand consistent. Make your socials match your site colors and style as well. Here are a few effective and affordable musician’s websites we have built recently. Don’t forget to link to your socials! Most of the site builders featured above will help you do this. Your website should be a focal point, where a new fan can find everything you’re doing in cyberspace. A Spotify follow button is also a good addition to a homepage. Your pitch does not have to be lengthy to be effective; it just has to explain your sound in a few words or sentences and, if you can, add it to your homepage or make sure it really stands out in your bio. Here is a 2-part video series to help you along featuring me and Derek Sivers. Your bio is very important. Make sure it is up to date, tells a story and is captivating. It is after all the foundation of your brand. You must have a press section/press kit on your site that displays photos, links, your bio and album art. Embed your best videos, put up your best press quotes, link to an interview you did with a music blog. The more legit you look, the easier you make elements findable for writers and promoters. TIP: Photos/Images. Make sure your photos really capture who you are, and give clear instructions on how they can be downloaded. Make sure people can find where to buy your music (iTunes, Amazon, etc.). People are so used to streaming nowadays, that if your homepage doesn’t have a readily available Soundcloud or Spotify link, they may lose interest. An embedded Bandcamp link is a good compromise for this (people can stream it, but there’s still an option to buy, or even better – pay what they want). And if you have Merch add it too! We recommend using Bandsintown for this. This allows you to link your shows across different platforms. To have your fans alerted to your shows while they are in Spotify streaming your music, you need to use Songkick. You need to direct people to sign up for your newsletter! This means you also need to send your newsletter at least one time a month with great attention to what actually goes in it. A ‘free download in exchange for email’ box is an easy way to build your list. I recommend using a Noisetrade widget. Create an artist account, upload a track (or two, or ten) then go to the Tools section and scroll down to ‘Embeddable Widgets’. This will give you a beautiful little button to put on your website. Make sure that you have your contact information with an e-mail address or a contact form so people can contact you for online publicity, booking, or just to tell you they like your music. TIP: Don’t make it hard for anyone to connect with you online. Nothing pisses the media or a booking agent or venue off more than having to hunt you down to talk to you! You need to make it easy for people to find you on Twitter, Facebook, Instagram, YouTube or wherever else you want to be found. Remember, your social channels and narrative should also match the tone and style of your site! See how our client Laura did it above- she GETS IT 🙂 See how it’s all red and blue and muted and wonderful? After your site is complete, make sure you return often to keep it and your socials updated! That means daily for socials and at least once a month for your site. This way your whole site remains interesting and dynamic and fans will stop by again and again. Good luck, be creative, and have fun! 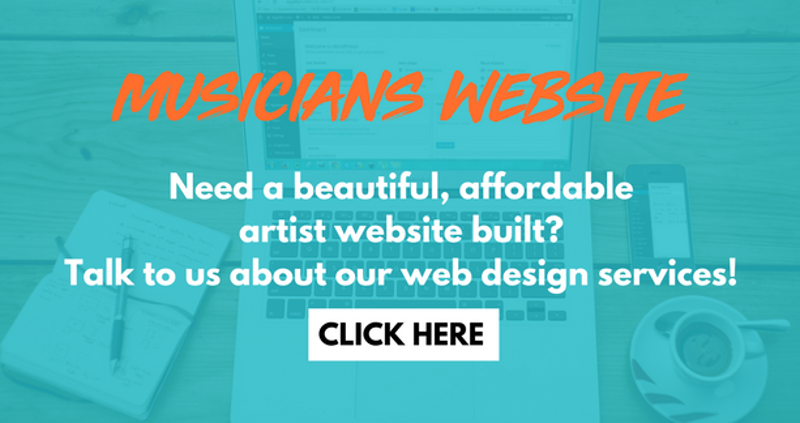 Want to have us design a musician’s website for you?